If you have never tried baked pears, you are in for a wonderful fall treat. This low-calorie baked pears recipe uses healthy pears which are already low in calories and stuffs them with a wonderfully sweet but still healthy mixture of dates, walnuts, and raisins. Then all is baked together with a heavenly aroma of cinnamon and sugar. The result is a dessert that speaks fall time and is still relatively healthy with lots of fruits and dietary fiber. Spread the walnuts evenly in a single layer on a small baking sheet that has been coated with cooking spray. Bake the walnuts for 3-4 minutes, or until they are lightly toasted. Set the walnuts aside until you are ready to use them. Place the orange juice, brown sugar, cinnamon, and salt in a small saucepan, and heat over medium-high heat until small bubbles begin to break the surface. You do not need the mixture to come to a full boil. Continue to cook the mixture for two minutes, stirring constantly with a wire whisk, until it is slightly thick. Add the dates, raisins, and walnuts to the mixture and gently stir them in. Remove the mixture from the heat. Place the pears, cored side up, in a single layer in a small baking dish. Use a slotted spoon to remove the fruit from the pan. 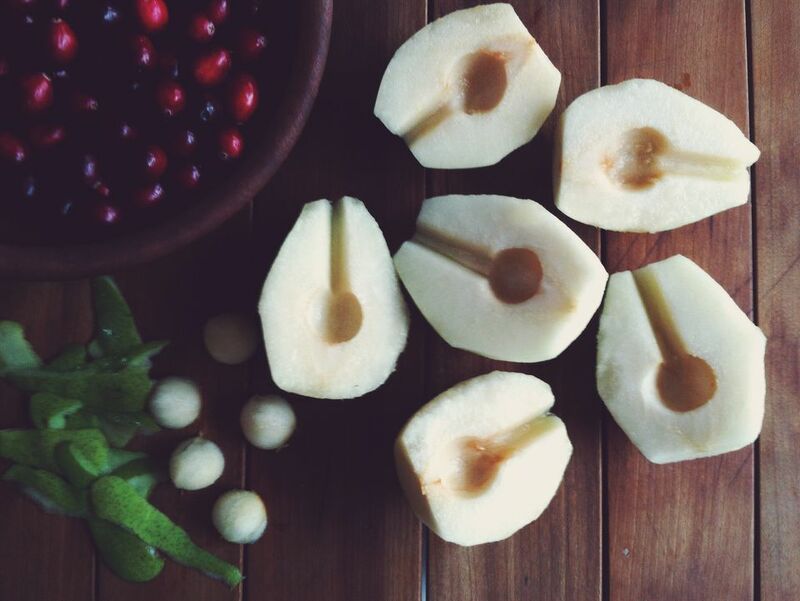 Spoon the fruit mixture evenly into the cored portion of each pear. Drizzle with the remaining fruit syrup from the pan, reserving 2 Tbsp of syrup for garnishing after the pears have baked. Bake the pears for 15 minutes at 375 F until they become tender. Remove the pears from the oven, and then drizzle them with the reserved syrup.Serve immediately while the pears are still warm. To prepare the pears, first slice the pear in half, from the stem downward. Then, simply use a paring knife to cut a small circle around and beneath the core, and then upwards towards the stem. Then, remove the cut portion with your fingers revealing a nice hollow spot perfect for stuffing.